He arrived with a wheelchair, ace bandages, and antibiotic cream. 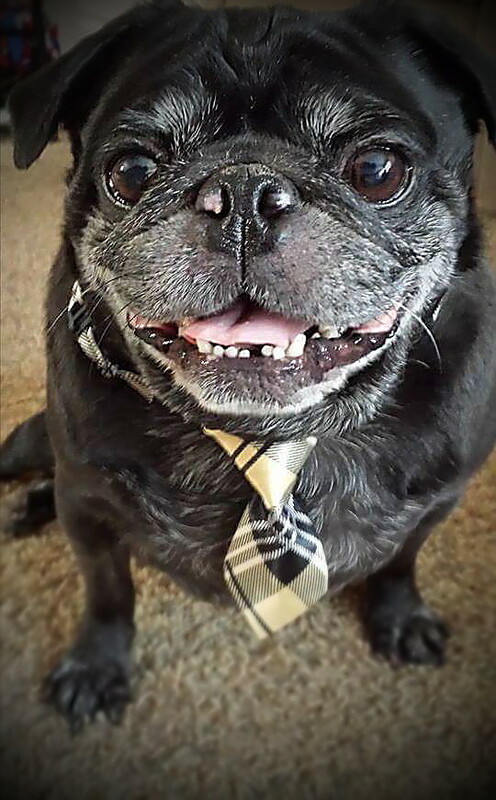 Karma the Pug was a mess when he moved into Elyse Premo’s Wisconsin home two years ago. His limp back legs were bloody. He’d clearly been dragging them around for while before ending up in the care of Pugtastic 7, a foster-based rescue for Pugs in need across Canada and the United States. “When I first got him, his eyes were dull — he was so sad,” Elyse recalls. A volunteer with the rescue, Elyse already had two Pugs of her own when Pugtastic 7 was looking for a home for Karma. He was seriously injured and incontinent when he came into care from Florida, where he’d likely been a victim of animal abuse. “All I really know is that a vet believed he’d been kicked,” says Elyse, who felt compelled to take him when Pugtastic 7 had difficulty securing a foster home. Thanks to a network of caring transport volunteers, Karma arrived at Elyse’s home, his formerly curly Pug tail hanging straight as a result of his extensive back injuries. After introducing Karma to her own Pugs — sisters Star and (the late) Matilda — Elyse’s first order of business was getting Karma to the vet. Unfortunately, the doctor wasn’t hopeful about the future of the partially paralyzed, incontinent dog, and recommended Elyse euthanize her foster Pug. In that horrible moment, Elyse realized she would never give up on Karma. He had found his forever home. 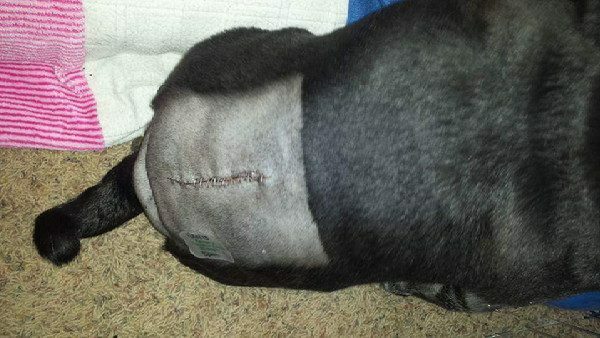 She sought out a second opinion with a specialist, who suggested an MRI would be the first step in figuring out what was wrong with Karma and if or how his back legs could be repaired. The test was expensive, so the folks at Pugtastic 7 began raising funds through Facebook auctions. Finally, the day came for Karma’s MRI, which revealed three damaged vertebrae in his back. The good news was he was a candidate for surgery (although a return to full mobility was far from guaranteed). The bad news — the surgery would cost $5,000. Fundraising efforts began again, and Elyse and her husband added plenty of their own money to get Karma’s surgery fund to its goal. In January 2015, eight months after he came to live with Elyse, Karma went into the hospital for his operations. In addition to the back surgery, veterinarians also shortened Karma’s elongated soft palette. The physical defect common to Pugs was making it difficult for him to breath. After surgery, Karma stayed in the hospital for a few days before coming home with Elyse. He’d been through a lot and was on some pretty strong drugs, including fentanyl patches. Elyse didn’t want to leave him alone for a second. “That first night I slept on the floor with him in the front room. I laid with him like that on the floor for a week,” she recalls. With each passing day, Karma got a little stronger, no small thanks to Elyse’s husband. A former veterinary technician turned athletic trainer, he had the skills to provide Karma with massages and physiotherapy. “He put what he knows about rehabilitating athletes into rehabilitating Karma,” says Elyse, who was happy when it was time to head back to the animal hospital for Karma’s post-op appointment. “They took the staples out and put him in a water treadmill to see how he would do, and when they took him out, he walked, almost ran to me,” Elyse recalls. It was clear Karma’s days on wheels were over. 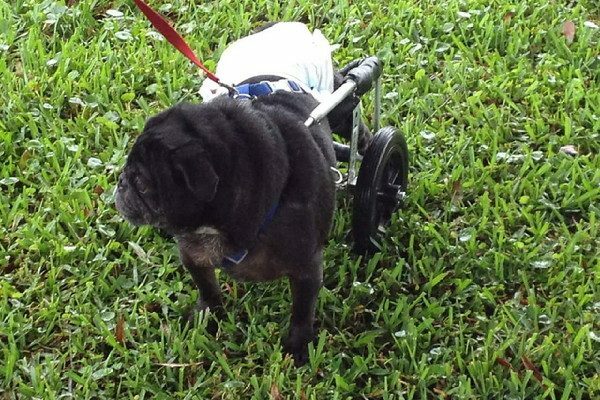 Elyse kept one of his two wheelchairs in case of a future setback, but donated the other to another Pug in need. His wheels aren’t the only thing Karma left in the dust. He was quick to show Elyse that he didn’t need diapers anymore either, happily doing the potty dance he learned from his sister, Star. Elyse hopes Karma’s story encourages more pet parents to seek second opinions and options other than euthanasia. The post Karma the Pug Heals and Walks Away From His Wheels appeared first on Dogster.